Liquid Pool Covers - Does Your Pool Need to Gain More Heat? Recently I have been receiving quite a few inquiries about Heatsavr's affect on solar gain. Many people understand that by using our liquid pool cover, their pool will retain up to 50% of the heat that is normally lost to evaporation - which can mean the difference between many degrees a day for some swimming pools. 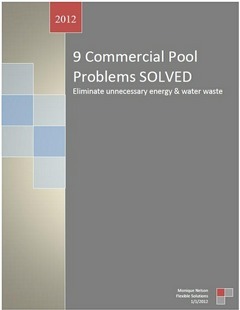 The question then becomes, will HeatsavrTM still allow the sun's heat to get in the pool, to help warm it up more. There is more at stake than simple heat retention - you want a heat increase! Well, I am happy to say that yes, HeatsavrTM will allow the sun's heat to get in the pool to help increase the temperature of your water. In fact, HeatsavrTM will even help you gradually build the temperature at a faster pace. On the one hand, if you decrease your overnight heat loss by up to 50%, each morning you will have a higher starting temperature to begin with, allowing your pool water to gain more heat during the day. That alone will build the temperature. But, as I am sure you know, even during the day when the sun is shining and actively heating up your pool, the water is still losing heat to evaporation. By having a liquid pool cover on your water 24 hours a day, you will be reducing the heat loss even during the open hours. This will help your pool keep more of the heat it gains throughout the day, building up your water temperature even more. I can say with confidence that Heatsavr will increase the heat in your swimming pool. I've personally tested this chemical in small amounts of water and I saw a 5 degree increase using Heatsavr compared to not using it in just 48 hours. That's a huge difference! Using Heatsavr or the Ecosavr is just a smart idea if you have a heater or not. Although, if you have a heater, it will definitely save you money on your gas bill, that's for sure.